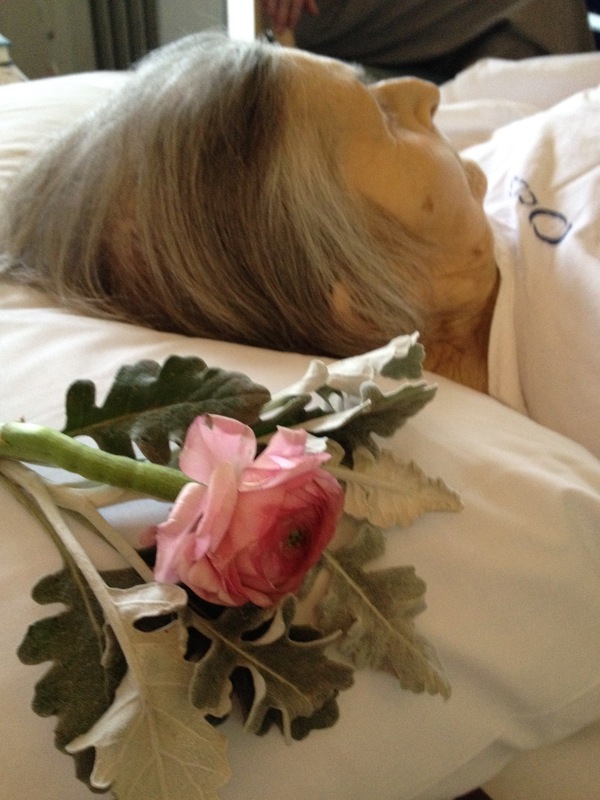 They shifted my mother into a private room, as if they knew she was dying even when they had plans to move her off to a nursing home as soon as they could, so she could live out her life in care uninterrupted. The little things that had needed their help they’d overlooked, like the puffs of white on the tip of her tongue that she was forever trying to spit away. Until they decided to take out my mother’s denture this thrush came back again and again to torment her. This woman who could no longer swallow and who no longer wanted any food or water to pass her lips. In the last weeks of her life I increased my visits, not that my mother appreciated them, but out of some sense of guilt and some sense I needed to get there to see her as much as possible before she would be no more. She kept her eyes closed throughout these times, opening them only briefly to catch a sight of this person, her daughter hovering over her. And each time she opened her eyes I sensed, not a look of recognition or of pleasure, but a look that said ‘leave me alone’. Let me be. It was twilight and the sun was doing its last trip through the sky, letting just enough light into the room to make artificial light unnecessary. I had touched her gently on the hand and my mother’s eyes flickered open, after a shudder, as if her body expected some unwanted intrusion. I had only just arrived and I did not want to leave too soon so I hung about closer to the door than to my mother’s bed at one side of the room. I watched her for signs of life. 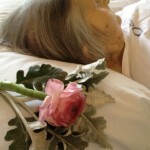 I watched her as if I knew this would be my last turn to see my mother alive. I watched her in the hope that I might soak in some last minute radiance from this woman who had once welcomed me into the world, who had nursed me for the first three months of my life and had then slipped me off her lap to make room for the next lot of babies that followed me in turn. I recognised the same hooked nose, the same pointed chin, but her skin, once a vibrant olive glow, had turned sallow and her hair had lost its shape and hung back like a dishcloth from her forehead. It draped around her pillow lank and greasy. It was a strange and secret time standing there to look upon my mother as she lay dying. A time of reconnection and of severance. All my life I had lived with the knowledge I could never keep up with her. She was always thirty-three years older than me, always thirty-three years wiser, thirty-three years ahead of me in advantage and knowledge. She let me know this often; with every choice I made, except those that suited her. My choice of husband was wrong, my choice of schools for my children, my choice of career as a psychotherapist, my lack of religion. All these things had rankled my mother and she let me know this without words. A hint of disapproval whenever we met such that I had long ago stopped talking to her about the innermost workings of my mind. And I had learned to turn off my own interests whenever she started up on topics of her choice, especially those related to her God and her disapproval of others who took no interest in that God, for surely she was talking about me again. Me and my godlessness. This God, or lack thereof, who came between us. My mother looked up then, turned in my direction as if she had noticed the soft rise of my breathing or felt my warmth nearby. She turned and opened her eyes. She looked at me and with all the strength she could muster she lifted her hand in such a way as to usher me away. Go away she seemed to be saying, go away and leave me in peace. I took her instructions, the last sight of my mother alive, a dying woman who wanted me gone. I was there when my mother died. I think I was standing beside her when she actually passed but I might’ve been in the next room. Either way I didn’t realise it until Carrie called me—I was phoning for an ambulance against my mother’s express wishes—and told me her lips were turning blue. The ambulance arrived quickly—remarkably quickly—and they did their stuff but it was too late. Oddly enough despite having received first aid training I never thought to try to save her. That’s not the sort of thing you want to stop and think about for too long. She had melanoma and was looking at an unpleasant few years ahead; the pneumonia did her a favour. My mother also disapproved of many of my life choices. I actually think she was grateful to have Carrie there—a woman she wouldn’t let in her house until we were married remember—because it meant she could deal with her—her “angel”—rather than me; if only for practical reasons she was happier being manhandled by a woman. After they took her away I called my siblings who, as you do, dropped everything and arrived the next day I suppose; I can’t remember when they arrived to be honest. They went to view the body. I didn’t. My brother said he regretted that decision. Now I think about it no one went to see Dad when he died. It’s hard for parents when their kids don’t turn out the way they expected or at least hoped especially if they make choices that’ll hurt them. As far as my mother was concerned by rejecting her faith—not the faith she’d been born into but the one she’d chosen—I was as good as committing suicide. How could I do that? It’s hard when we let our parents down in the choices we make, Jim. You and me and so many others too. At least you had a chance to sort of say goodbye to your mum. The worst to my way of thinking is when someone who matters to you dies a long way away and you’re left almost convinced they’re not yet dead. That’s happened to me a few times now and I’d rather be around when the ones I love die, than far away. Thanks, Jim. This is so stirring, honest and sad. My husband and I were together for almost 38 years yet all I remember are his last few months. I would stay awake till after midnight every night because I feared that he would quietly slip away while we were all asleep and I needed to know which side of midnight he had left us. As it was, it was in the early evening when we were all together. We were each connected to him through touch and when it was all over, I opened a bottle of champagne I had put on ice for that very occasion, to thank him for his years of devoted love and to wish him well on his next journey. I’m sorry you felt such disapproval, Elisabeth. It must have hurt a lot. What a beautiful ending for all of you to your husband’s life, Karen. And the idea of celebrating with a bottle of champagne seems so fitting. My mother’s disapproval was muted in some ways because I believe she also loved me, as she loved all her children. My mother was not so good at dealing with the negatives though and so perhaps they slipped out when she least expected. Thanks, Karen.